I try to keep my FireFox plug-ins streamlined, but after testing Invisible Hand only this morning, I'm addicted to its unobtrusive, deal-finding prowess. Say you want to buy a new Sharp LCD. 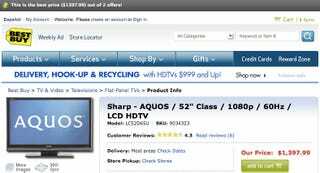 You pick out a model on Amazon or Best Buy, and while you're inspecting the product page, a small drop-down may inform you that Buy.com (or one of 50 other comparison stores) has the television for 1% cheaper than where you were shopping. It's not the only plug-in of its kind, and I was able to beat that tested deal pictured above by searching myself, but the visually quiet interface may keep you from uninstalling the thing by the end of the week.